We all know that Dachshunds hate the rain but I had heard that they love the snow. I was so excited this morning to see our Spanish village covered in a layer of beautiful snow. When Dachshund Luke emerged from under the blankets (2 hours after us) I grabbed the camera and we headed out of the door. Dachshund Luke had done his happy dance to my magic words “Do you want to go for a walk” but skidded to a halt in our doorway looking annoyed with this cold white stuff that had invaded his driveway. Ok, I just thought he was unsure of what to do with the snow so scooped him up and marched outside. I gently lowered him to the ground. He sniffed the snow, shivered and then lifted each foot as high as he could – which is only about 3 inches – then begged to be picked back up – by jumping at my leg leaving tiny wet cold patches on my jeans. We tried this a few times but he was not amused. He is now back inside and after wiggling on the sofa is happily snuggled back under the blankets in our bed. 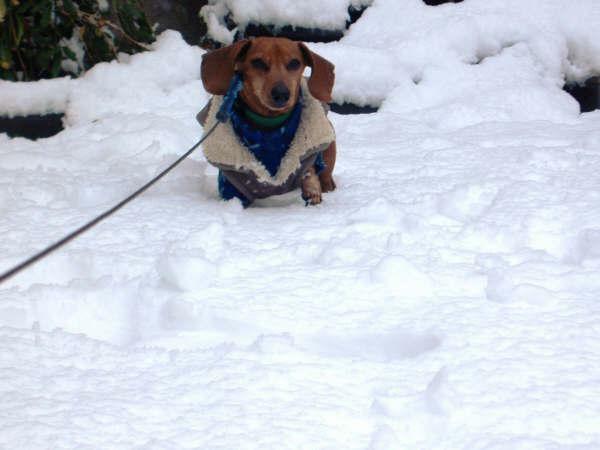 Maybe I will try again later but I think Dachshund Luke is one of those Dachshunds that just thinks snow is cold rain. 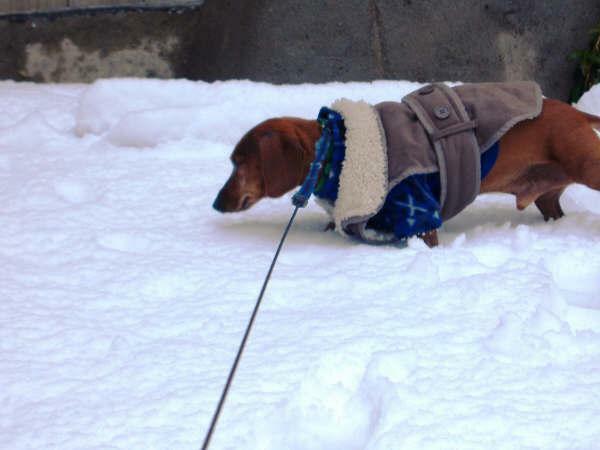 Does your Dachshund like the snow?